I've been looking for fun ways to collect quantitative data in my statistics class. Let's just say my students are tired of surveys of how many siblings they have or how many states they've visited. I got this activity from @druinok. Here's the word document version she posted. She calls it the "Game of Greed," but I've played a slightly different version with students before called Greedy Pig. I modified it in just the slightest way to make it into a booklet foldable that will glue into my students' interactive notebooks. I was really impressed by my students' answers to the benefits of the various types of graphs. They had been really hating on boxplots lately, but they did note that they could come in handy for various things. Want to know what made the activity? We didn't just roll any die. 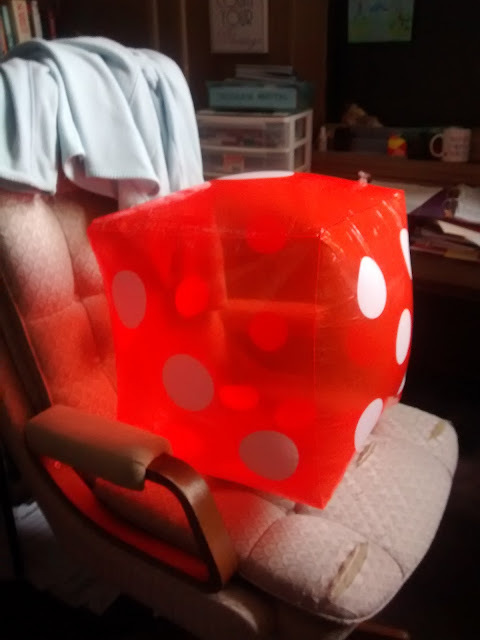 We rolled this jumbo blow-up die that a coworker gave me last year. Had I known how big this die was, I probably would have changed my mind. But, it was new and in the package, and just looked like a fun die. This thing is huuuuuuuuuge. It took forever to blow up! 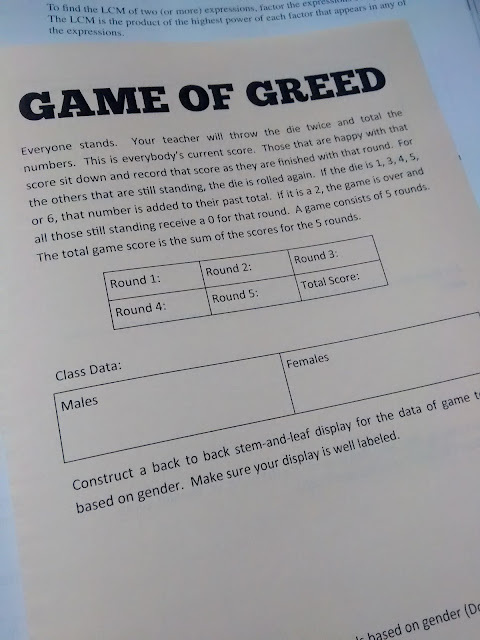 My students had a lot of fun playing this game, and they seemed legitimately interested in the data analysis because they wanted to know if boys or girls were better at the game. Of course, I had a group of boys decide they were all going to stay in/go out at the same time, so that definitely influenced our data. Want my (only slightly) modified version of this activity? I've uploaded it as a PUB and a PDF file here. 1) Take a look at I quant NY. A lot of really great stuff. 2) public data sets on Amazon: AWS. My understanding is that these are large data sets. 3) A great list of data sets: Awesome public data. Should be something for everyone on this list. Can't wait to check these out. Thanks!